Even though Charlene has plenty of scratching post and pad options readily available to her, she fancies the living room rug. Her favorite spot is EXACTLY in the center of the rug, which drives me insane. Whenever she's allowed to step out on the front porch, she always stops on the sisal doormat for a quick scratch. Craig had the idea of getting Bean her own mat JUST for her to use inside. Last night, I went and picked one up for her. So far, it's been a huge it. She absolutely loves it, and we hope it will help keep the damage to a minimum on the area rug. If you have a kitty with similar scratching issues, I suggest you give it a try! And it has BIRDS on it too! That's awesome! So much more attractive than a plain sisal mat; perfect for Queen Bean. And I love how she positioned herself just so for a great shot. She must get her photographer's eye from you, Laurie. Of course her favorite spot is in the center of the rug. She's supposed to be the center of attention. Where did you get this mat? I need a door mat for my new apartment! This is such a good idea! Alfie always scratches the sisal doormat by our back door. I think he would love one of his own! Charlene is SUCH a beautiful and remarkable cat. I know she is a rescue cat but what do you think is her "heritage?" She has some of the markings of a Siamese but is so floofy. We need kittens! Any word? That's a great solution! I think I'm glad my kitty is obsessed with cardboard scratchers. They make a little mess, but my carpet is safe! Can't wait for my next trip to Target! One of my cats had a tendency to scratch on our carpet, so we picked up a carpet scrap one day just for her. A little catnip on it encourages her to use it instead of ours! I've had a sisal mat that says "Wipe Your Paws" that my cats love to scratch on. I didn't get it for them, but they think I did. I saw an episode of "Cat from Hell" and the cat was damaging a Pilates table that the owner used for classes she taught at her home. The CFH dude had a little Pilates table/bed made for the cat. Problem solved - cat loved it. The mat is perfect for Ms Bean but I do think a litter of kittens might also keep her busy and away from the rug. Not that I advocate homeless kittens but . . . It matches her lovely blue eyes! I've always had big sisal mats in lieu of rugs -- I like them, they look clean and elegant with my mid-century modern furniture, and the cats can use them as scratchers to their heart's content. And they're really, reall cheap at Ikea. Oh Bean, you're so cute! Yep, my cat prefers the sisal rug under my bed to any other scratching milieu. It looks beautiful with her blue eyes! A welcome mat you say? Hm...may have to buy the boys one this weekend. And Ms Charlene let us say whatever diet you are following you a looking very trim indeed. Maybe it's not having kitten biscuits to sneak? Truly amazing pictures/video. It's hard to imagine that Bean has any bad habits as she is such a good girl--but I'm so pleased she loves her new rug. In our house, the naughtiest cat, super sweet Blue, is the best with scratching. He jumps onto his double wide cardboard scratcher, scratches away and then jumps off and does his thing. Remy is the worst--she likes to scratch upholstery, beds and legs at night. Oh hooray, I'm glad to know sisal mats are cheap at Ikea! I had picked up a couple at Walmart to put outside the litter pans, to help catch the stuff they track out, and was delighted to find they love scratching on them too. Handy! Ahhh, the lovely Charlene has received the honor of a personal sisal mat...that matches her eyes! And now Charlene has her very own place to do her nails. One of my cats, Jasper, has been demolishing my new area rug...I have resorted to covering the rug with sheets when I am not home. It has been ridiculous. Now I will try your idea...wish us luck! I discovered after adopting my cow cat that she loved scratching the carpet. She rarely bothers the carpet now since I purchase flat and ESS cardboard scratchers for her. I hadn't thought of a sisal mat but will try it. It will last longer than the cardboard! My cat Spike loves sisal welcome mats too! Both the "fluffy" rough kind like Charlene has, and the braided rope kind. He also loves scratching the rubber on the bottom of the mat too. A couple of years ago, I found a tiny, cat-sized sisal mat at either Petco or Target. The smaller size is great for the living room! One of my cats is a horizontal scratcher. She doesn't like to stretch up a post. This is an excellent idea. 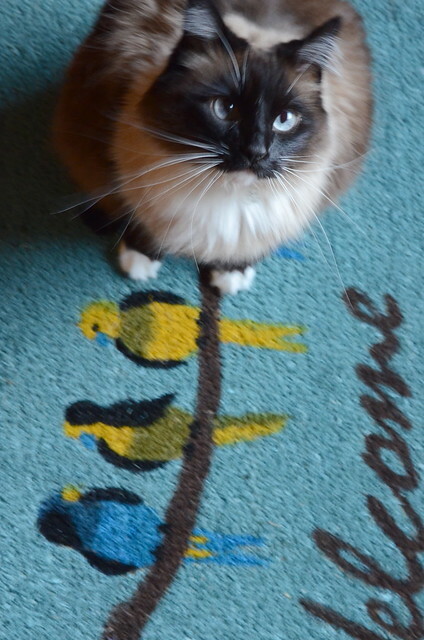 My rescued kitty, Saya, LOVES our neighbor's sisal doormat across the hall (we live in an apartment). She sits at the door and cries, and every time we come or go, she escapes and runs STRAIGHT for the mat. I've been telling my boyfriend we just need to get her a sisal mat of her very own. Your post finally convinced him to let her have one! Maybe I won't have to allot extra time every time I want to open my front door now! P.s. Saya also likes to play with - not just scratch - my smaller area rugs. She rolls around in them and scrunches them up, pushing them across the floor. So naughty! A sweet kitty furriend recommended I come here to see this because my cat tho she has two cardboard scratchers and a scratching MAT plus a sisal rope scratching post and a carpeted one claws my good carpet!!! By chance I bought her her own throw rug two days ago and so far she's using it. So that's a great idea and I hope more see this.